Route #34 leads to a large city that has a Radio Tower, a Bike Shop, and a huge Department Store. There are many things to see and do there—make sure you've accomplished them all before you head off to the next city or route. Team Rocket is skulking around the city. Sensing that you're a guy (or gal) who gets around, the manager of the Bike Shop (lower right corner of the city) will offer you a free bicycle if you promise to advertise his shop by riding around. When you wander into the Bike Shop, the owner will ask you to ride around on one of his bikes to show everyone how much fun it is. You can move much faster with the bike. You can register the bike by selecting it in your Pack, then choosing SEL from the menu. After that, just hit Select when you want to ride. 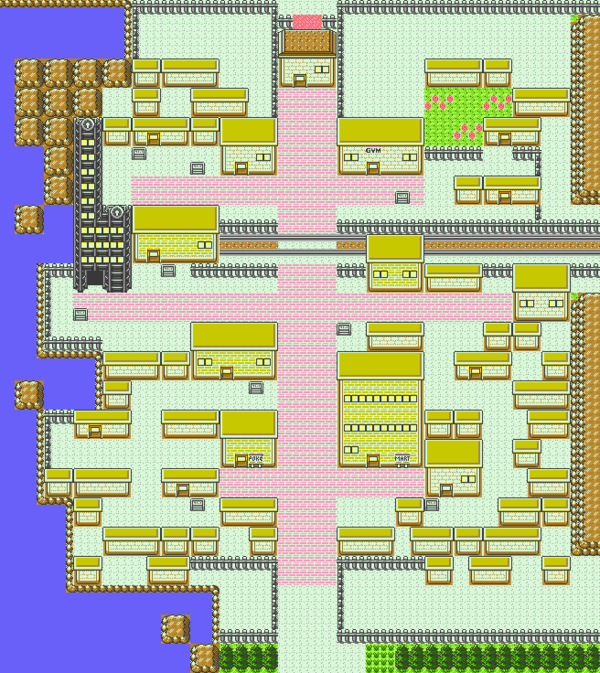 Bill's home is here in Goldenrod City (the leftmost house in the southern portion). He's currently away in Ecruteak City, but his mom and sister are home. If you drop by to visit his family, Bill's sister will give you his phone number, which you can use to check how full your current box is at any time. Even if you don't get his number, he will call you if you fill up a box when catching a new Pokémon. Bill will head back home after you meet him in Ecruteak City, and if you come back to his house afterwards, he'll have a very nice surprise waiting for you. If you'd like to know what that is, please see the Ecruteak City page. A name rater lives in Goldenrod City. If a witty name for a favorite Pokémon has finally occurred to you, come to the guy who lives to the left of the Gym and he will rate the name of a Pokémon in your party (your choice). He will give you the option of changing that Pokémon's name. Unfortunately, he won't let you change the names of Pokémon you received from other players or in-game traders. Certain Pokémon now evolve based on the hidden stat "Happiness". If you want to check how happy a Pokémon is, put it in your top slot and talk to the woman in the house above the Bike Shop. She'll tell you what your Pokémon thinks of you, so you know how much you need to spoil it. A woman in the Goldenrod City Pokémon Center wants Eon Mail in a big way. She'll trade you a Revive for each one you give her. The best way to get Eon Mail is by using Mystery Gift with a Pokémon Pikachu 2 GS (shown right). Since Mail costs 0 watts, you can do it over and over again and get an unlimited amount of Eon Mail. If you don't have a Pokémon Pikachu 2 GS, the only way you can get Eon Mail is as a random Mystery Gift item. The woman in the small house in the Northeast corner of Goldenrod will give you information about the living tree blocking the way to Route #36. In Gold and Silver, after you beat Whitney, the Goldenrod City Gym Leader, go back to the house and she will give you a free Squirtbottle to use to bother the tree. But it's a little more difficult in Crystal. You'll have to head northeast, cutting through Route #35, and find the woman's daughter standing by the Sudowoodo tree on Route #36. Follow her home and mom will give you the Squirtbottle you need to proceed. As you leave Goldenrod to the north, talk to the guard in the guardhouse. He'll ask you to deliver a message to his friend way back on Route #31 near the entrance to Dark Cave. The message comes around the neck of a Spearow, so you'll need an empty slot in your party to accept the Spearow. If you complete the errand, you'll get TM 50 (Nightmare) from the friend and an HP Up the next time you talk to the guard. You can do it now if you want, but if you wait until you unblock the path to Violet City at Route 36, it will be a lot easier. If you switch out the mail on the Spearow to another Pokémon, you can get a Spearow that gets extra experience, and can still get all of the items. However, note that whatever Pokémon you give the mail to will be claimed by the friend, so make sure to not give it to anyone important. The Goldenrod City Station is a train station. The train won't be coming in for a long while, although you won't know that right away. When the Magnet Train finally does start to run, you will be able to take it to Saffron City in Kanto. But you have to fix the train's power supply and find a ticket in Kanto, and that is still a long way off. you can catch wild Pokémon. wild Pokémon, depending on the tempo. Pokémon you own, you can win a Master Ball! Many popular Radio Shows are broadcast from the Radio Tower, including Pokémon Talk with Professor Oak and DJ Mary. The station is having a contest. The Radio Tower is currently giving away Radio Cards to anyone who can pass their Pokémon quiz. Talk to the third person behind the counter to take it. For a pro like you, the quiz should be no problem. But if you do mess up, you can always try again (or just cheat: The answers are Yes, Yes, No, Yes, No). Once you insert your Radio Card into your PokéGear, you can enjoy their wide array of programs (see the sidebar on the right) including the Lucky Channel. The program broadcasts one number a week. If your Pokémon match that ID number, you win. Trade with as many Trainers as possible during your journey to acquire Pokémon with several different ID numbers. Each week, the Lucky Channel selects a different number, so tune into channel 8.5 regularly. If you do have a matching number, go to the Radio Tower to claim a prize. This tunnel connects the lower and upper corners of the Western side of Goldenrod City. It's home to a handful of trainers, the Pokémon Salon, and a pair of shops with erratic business hours. It's also where you'll find the Coin Case. With this item, you can begin gambling at the Goldenrod City Game Corner (see below) whenever you're ready. The door at the end of the side path leads to the warehouse beneath the Department Store, but it's currently locked. The top shop is only open Monday mornings from 4am to 9am. It sells valuable items (like Nuggets) that have no use, but could be resold at other shops for a small profit ( 500~ 1000 each). If you have a lot of cash, it might not be a bad idea to buy a bunch so you won't risk losing your money if all of your Pokémon faint. 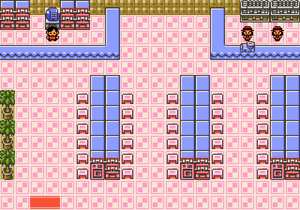 A nice beauty treatment will improve the "tameness" of any Pokémon (you can get one done once a day). The middle shop is manned by two brothers: The younger works Sun., Wed., and Fri. and costs 300; the elder (who does a slightly better job) works Tues., Thurs., and Sat., and charges 500. It's closed on Mondays. The bottom shop is only open on weekends. It sells items that heal or revive Pokémon, and are cheaper than the standard Pokémon Mart versions. 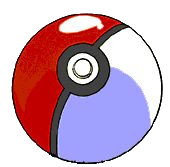 The catch is that Pokémon hate the medicine, so using it will lower their "tameness". You do more than just buy things in the Goldenrod City Department Store. Talk to everyone inside the store for interesting information, including news of a woman who visits the store every Sunday and hands out TMs to Trainers, and a boy on the fifth floor wants to trade a Machop for one of your Pokémon. You can get all sorts of great things here. 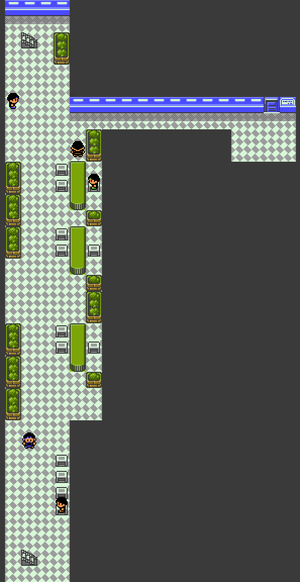 The supplements on the fourth floor permanently beef up your Pokémon, the TM's are great (note that Headbutt and Rock Smash aren't available until you earn them elsewhere first), and the Lemonade for sale on the sixth floor is the most economical healing item in the game. If you can make it to one of the occasional rooftop sales, a new feature in Crystal, you can get even better deals. The woman in red behind the counter on the fifth floor shows up on Sundays. She'll give you one free TM when you first talk to her: TM 27 (Return) if your lead Pokémon is in a good mood, or TM 21 (Frustration) if it's in a bad mood. Unless you routinely abuse your Pokémon, TM 27 is the one you want, so check with the Tame Tester first. Make sure that its tameness is at a high or low enough level to receive a TM, however. Also on the fifth floor is a boy who will trade his Machop for your Drowzee in Gold and Silver, and for your Abra in Crystal. Don't miss this opportunity to get a great Pokémon early! As a nice bonus, it comes with a free Gold Berry in its pouch, which can restore 30 HP to a Pokémon. Also on the fifth floor you can buy TMS like Ice Punch,Fire Punch and more. There's no real schedule to the rooftop sales held at the Department Store, but if you traded phone numbers with Todd on Route #34, he'll give you a heads up when one happens. Everything is about 25% off, and the stock (which may change on later sales) includes some hard-to-find items. In the basement, there are three men working, all of whom will shoo you away. Go in the elevator, go to any floor, go back to the basement and they will have rearranged the boxes. You can collect three items this way, if you repeat the action three times (Ether, Ultra Ball, and Burn Heal). The fourth item, and the staircase down to the second basement, are behind a locked door. You won't be able to access them for some time to come. The Goldenrod City Game Corner has two games of chance for you to play. Both are pretty difficult but very fun. You can't play the games until you've picked up the Coin Case in Goldenrod City's Underground Path. Exchange some of your money for coins—then you can play at any of the game machines. In both versions, you can win an Abra (which you can trade for that Machop) and you can also trade in your coins for the game's best Fire, Ice, and Electric TMs. The big prize in Gold and Silver is Dratini (which can also be caught at Dragon's Den, later in the game). 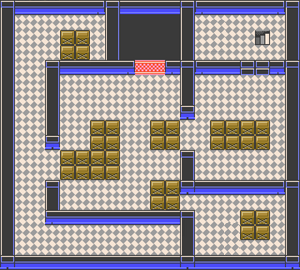 In the Crystal version, the unique Pokémon that you can win are Wobbuffet (which can also be caught in the Dark Cave) and Cubone (which can be caught much later in Kanto's Rock Tunnel). Stop the three revolving wheels on the Slot Machine one at a time with . If you bet three coins, you can win with any horizontal or diagonal line of three identical symbols. Bet two coins—any horizontal row wins. If you bet one coins, the three middle symbols have to match. Each symbol's payoff is shown in the lower portion of the table. The slots are a little different this time around. The individual wheels stop at a set distance after you hit the button, so it is possible to get "into a groove" and make them stop where you want. This takes time, practice, reflexes, and may give you a killer headache. If that doesn't sound so good, try the cards. If you do do the slots, play three at once so you can score off of diagonals. After you take on Red at Mt. Silver, a man who is wise in the ways of Pokémon will appear in front of the Goldenrod City Game Corner. The Move Tutor only teaches moves on Wednesdays and Sundays. For 4,000 coins (Game Corner type), he'll teach one Pokémon either Flamethrower, Ice Beam, or Thunderbolt. Once you purchase a move from him, he'll disappear into the Game Corner. You can't get these TMs anywhere else in the game, so it might be a good idea to save up 80,000 . The card flip game is new in Gold/Silver/Crystal. Guess which of the 24 cards has been dealt on the left in this Card Guessing Game. You have 12 tries per game, and you must bet three coins. You pick on randomly generated card with , and it is placed on the left. Next, you choose a vertical row, a single or double horizontal row, or a single card. The fewer cards you bet on, the higher the payoff. Try choosing rows at first, then, as more cards are eliminated, move to the single cards. After 12 cards are eliminated, the deck is reshuffled and the game starts over. Every Trainer in Goldenrod City Gym is female, which is interesting but doesn't change anything. Trainers are Trainers. You have to get through quite a few Trainers to reach Whitney, the tough Gym Leader, but the first two of the four trainer fights are avoidable if you tread carefully (the trainers give good prize money though, so avoiding them isn't recommended). The Goldenrod girls prefer Normal-type Pokémon. 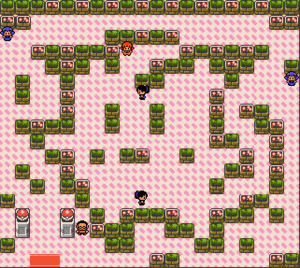 All the Pokémon in Whitney's Clefairy-shaped Gym (squint at the map if you can't see the Clefairy) are plain-vanilla Normal Pokémon. That means the Machop you can trade for in the Department Store would be obscenely powerful (even a low-level one can take down most of the Junior Trainers' Pokémon in one shot), Ghastly is not the best choice here as multiple pokemon here know Bite, which is a Dark-type move, making it highly effective against you. But you can use your Gastly to put your foes to sleep and then swap in something else. Whitney is absurdly tough for a third Gym Leader, with some formidable Pokémon: Clefairy's Metronome can screw up your careful plans if it gets lucky (for Clefairy), or completely backfire if it gets unlucky (again, for Clefairy). Miltank gives out a serious beating, which gets worse when you realize how high its Defense is. Try using female Pokémon against her Miltank; they'll be immune to Attract, which will cut the chances of your Pokémon attacking down to 50%. After you beat Whitney, she will start crying. Take a step back and Lass Bridget will explain to you that she usually cries after losing. Walk back up to Whitney and talk to her, and she will hand you the Plain Badge, which will allow you to use Strength outside of battle. You will also win TM 45 Attract. You can catch a wild Machop later, but you want one now, since the Goldenrod City Gym is just ahead and Fighting Pokémon rock against Normal Pokémon. And Machop is a great Fighter, especially now that it and its evolved form, Machoke, start with Low Kick and can learn powerful new Fighting moves like Cross Chop at level 37. The members of Dratini's family (except Dragonite) are the only pure Dragons in the game. All things considered, Dragon may be the best type in the game, and Gold/Silver/Crystal finally adds a truly powerful Dragon technique. It's Outrage (at level 50), kind of a Dragon-version of Petal Dance. If you buy your Dratini here in the game corner, you can get a good early start raising one of these powerful beasts. Pure Ground Cubone (and its evolved form Marowak), now have a third exclusive move: Bone Rush, a solid attack that strikes 2-5 times each turn. It's a Ground-type, too, so it's great against Fire, Electric, Poison, Rock, and even Steel Pokémon. Cubone also gets Bonemerang earlier, and can learn False Swipe (which is great for capturing wild Pokémon). Wobbuffet has poor stats but hardly needs them; It's got a ton of HP and it can only do damage by taking it. It gets four moves right off the bat (and never learns any more): Counter, Safeguard, Mirror Coat, and Destiny Bond. See the theme? Three of them reflect attacks back on their user. For a novelty Pokémon, Wobbuffet isn't too bad, especially when you're fighting a Pokémon with only Normal or Special attacks, so you know whether to use Counter or Mirror Coat. And Destiny Bond is always good for a K.O. on the way out. This page was last edited on 4 March 2019, at 00:54. This page has been accessed 1,042,230 times.